Will Applebee’s Let Me Eat for Free? In 2011 I attended an outdoor concert and took a few pictures of the band. The murals are compiled of digital images that represent the community from festivals, landmarks, events, sports, etc. We are not asking to license the image (you may retain all licensing/rights to your photos). We are requesting a one-time use. We are happy to display a photo credit with your name and website alongside any images that are selected for the final design. If you agree, please sign and return the attached photo release form granting us permission. Uh, let me get this straight: Applebee’s wants to use my images for commercial use but is not willing to pay for them? How about I go to Applebee’s and instead of paying for the food I give them “credit” by telling my friends how great they are or maybe wearing an Applebee’s T-Shirt? It’s this kind of behavior that has degraded the photography profession. People think pictures are free. Anyone with a cellphone can snap a picture. But if that picture has value to someone or a company, shouldn’t you be paid for it? It’s no different than an art buyer buying a painting for their home. Or if you go to Target or Wal Mart and buy a poster to hang on your wall. If you want the art, you have to pay for it. It has value. The “one-time” use is a permanent or semi-permanent display of my work no matter how many times it is used. That release form, by the way, states that my photo may be used “incidentally” if a picture of the interior of the restaurant happens to show my images in the shot. Great, so my images could be used to market the ambiance of the business, which is a factor in drawing in patrons; but Applebee’s cannot afford to pay a dime. I’m not sure if Applebee’s is to blame here or the company they hired to do the design. But that’s no excuse for a corporation not to ask where the images are coming from and it is certainly deplorable that Gate 3 wants to use images without paying for them. They “favorited” my images they want to use so I assume the other images in their “favorites” are also ones they want to use. You can see them here: http://www.flickr.com/photos/23746554@N04/favorites/. It’s clear they didn’t choose crappy cell phone pictures but rather quality images taken by people with skill. Credit is nice, but it doesn’t pay my bills. Even if you are not a professional photographer, if you have something of value that someone wants, wouldn’t you expect something in return? I’ve said it before and I’ll say it again: If you want to make money from photography, you need to have a contract and a license signed by you and the client. 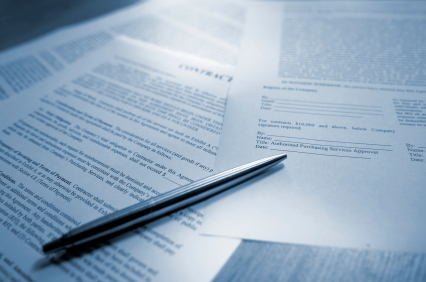 A contract is just an agreement between you and a client that specifies the scope and nature of your work. A license is the document that grants a client certain rights to use your image(s). I’ve seen some wedding contracts, for example, that include a model release and specifies what the bride and groom can and can’t do with the images. So in essence it’s a contract, model release and license all in one. Now, I’m no lawyer. That means two things; I can’t give you legal advice. Second, it means writing and reading contracts and licenses give me a headache. I’m a college educated person, but sometimes I have to re-read a statement several times and sometimes I still don’t know what it says! If you think about it, writing “and” instead of “or” can have serious implications in a legal document. So my first solution was to buy “Business and Legal Forms for Photographers” by Tad Crawford. The book comes with boiler-plate templates on a CD-ROM in various formats that you can use. The book walks you through what each line means and covers everything from model releases to wedding contracts and more. She goes on to say that licenses can be written in list form. That got me thinking. I’m now in the process of writing up a contract in plain english. It’s not that easy though. I’m referring to the legalese in the book as well as the ASMP web site and translating it into plain english. In the end, I think this helps both parties. Would you want to give a bride a 2-to-3 page legal paper to sign? Seems a little intimidating, I think. So my advice is to talk to your client and find out what their needs are. Then incorporate that into the contract. The contract I’m writing now, for example, really only has three core principles. First, granting limited use to the client. Second, protecting my copyright and by extension; Third, not allowing them to give my images to anyone else. If you’re serious about making money from photography you’ve got to learn about releases, contracts and licenses. Fortunately, the ASMP site is full of free information. On the homepage click on “Business Resources” then “Tutorials and Forms“. There you’ll find info on copyright, releases, an example of a bad contract and a terms and conditions example that you can include in your contracts.